Tent stakes are a small piece of gear. But if you have ever spent a night without them you know how big of a difference they can make. They have a very big job. 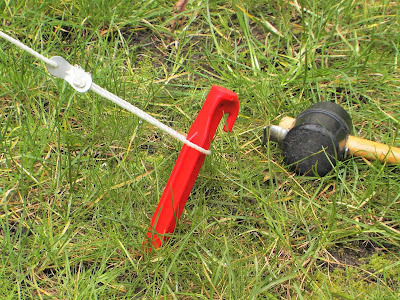 Tent stakes are used to anchor tents to the ground in one place. In the past, tents could not even stay erect without the stake to hold the fabric tight. Today a tent can be set up with out stakes but they are still necessary to make the tent secure. Tent stake are great because they can turn almost any type of ground into a place to call home. Without this key part, the tent may not be much good. Stakes can make the difference between an enjoyable night and a miserable one. In severe weather they can even save your life. When you purchase a new tent, they come with instructions warning that the tent is not secure unless it is staked down. In Isaiah 33:20 we read a promise God is making to the Children of Israel. He says that Jerusalem, their capital city and the place where God’s temple is, will never be removed. It will be like a tent with stakes they can never be plucked up. However, this promise is conditional. In verse 15 we see that the promise is conditional on the Children of Israel keeping their end of the covenant—they must stay faithful to God. Throughout the bible we find instructions on how we are to keep our end of the covenant God made with us by sending his Son to die for our sins. We must follow the 10 Commandments and we should worship Him. But this is not enough. We must also love our enemies; we must show mercy to those who don’t deserve it. We must be willing to sacrifice everything to follow God. Only then will we be sure that our salvation is secure as a staked tent in a storm. Tent stakes might make your tent look complete but don’t do much good if they are not used. Likewise, if we appear to have a relationship with God outwardly by doing all the right things, but don’t use God’s word to change our inward character, those outward actions don’t really do us much good. Tent stakes work best when used properly. What other instructions does the Bible provide for us to keep our covenant with God? How does a relationship with God change us on the inside? Photo Credit: Jan Uthoff via commons.wikimedia.org under a CC 3.0 License.